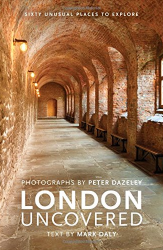 Also once known as Italian Hill or the Italian Quarter, Little Italy’s bound­aries have histor­ically been recog­nised as Clerkenwell Road, Farringdon Road and Rosebery Avenue. Over the course of the 19th century the Saffron Hill area – as it was earlier known – gained a growing population of working-class Italians. 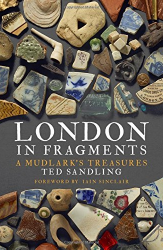 The author­ities were glad to see these indus­trious immig­rants progress­ively supplanting the pickpockets and fences who had made the area notorious and were vividly portrayed by Dickens in Oliver Twist (1837–8). St Peter’s church was conceived in 1845 by St Vincent Pallotti, a Roman Catholic priest and founder of the Pallottines, the Society of the Catholic Apostolate. The Irish architect Sir John Miller-Bryson modelled the church on the Basilica of San Crisogono in Rome’s Trastevere district. It was consec­rated as the church of St Peter of all Nations in 1863 and is now a grade II* listed building. The Italian consul published a report in 1895 estim­ating that his countrymen in London numbered around 12,000, with southern Italians tradi­tionally making their home in Little Italy while those from farther north were estab­lishing a newer base in Soho. 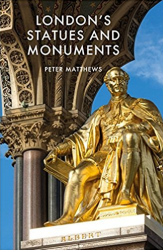 The plaster bust trade features in the Sherlock Holmes adventure ‘The Six Napoleons’, in which the villain is of Italian origin and Inspector Lestrade calls upon the help of a colleague who has made a speci­ality of “Saffron Hill and the Italian Quarter”. While some observers looked down on the Neapolitans and Calabrians of Little Italy – and Conan Doyle certainly depicted a few of them in a poor light – most acknow­ledged that they were generally striving to make an honest living. The concen­tration of Italians in this area reached a peak around the time of the consul’s report and during the 20th century the community spread itself more thinly throughout the capital. Sunday worship at St Peter’s has continued to provide a focal gathering point for Italians in London, especially at Christmas, Epiphany and Easter. 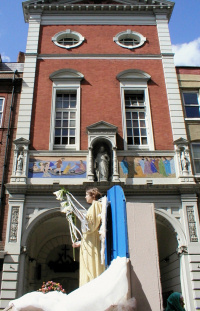 The procession of Our Lady of Mount Carmel – held on the Sunday after 16 July – is Little Italy’s most important event. Except during wartime it has taken place annually since at least 1896. According to the church’s historian, “it appears to have been the first outdoor Roman Catholic manifest­ation of faith [in England] since the time of Henry VIII’s Reformation” – and Queen Victoria is said to have granted special permission to the local police chief in Holborn for the parade to take place. Decorated floats began to feature during the 1950s and thousands of people line the streets around St Peter’s to watch the procession every year. Nowadays there are stalls selling Italian delic­acies too. To the west of the church there’s a handful of Italian eateries, including Casa Italiana San Vincenzo Pallotti and Terroni of Clerkenwell. Farther west, next to an Italian pizzeria, the Holborn School of Motoring (Scuola Guida) offers driving lessons in Italian. Or you can buy a Vespa at Scootech, 73 Clerkenwell Road. 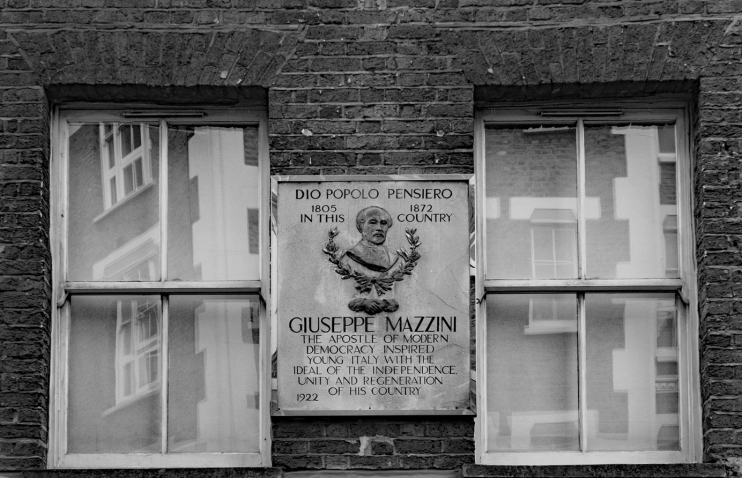 Giuseppe Mazzini, the writer, patriot and revolutionary, lived in Laystall Street and founded an Italian language school in nearby Hatton Garden in 1841. * Output area codes E00004520, E00004536, E00004539, E00004542 (all in Camden’s Holborn and Covent Garden ward) and E00013546 (in Islington’s Clerkenwell ward). Other output areas covering small parts of Little Italy are excluded because they also cover too much that is not Little Italy. The picture of the Mazzini commemorative plaque, at the top of this page is cropped from an original photograph, copyright Julian Osley, at Geograph Britain and Ireland, made available under the Attribution-ShareAlike 2.0 Generic Licence. Any subsequent reuse is hereby freely permitted under the terms of that licence.